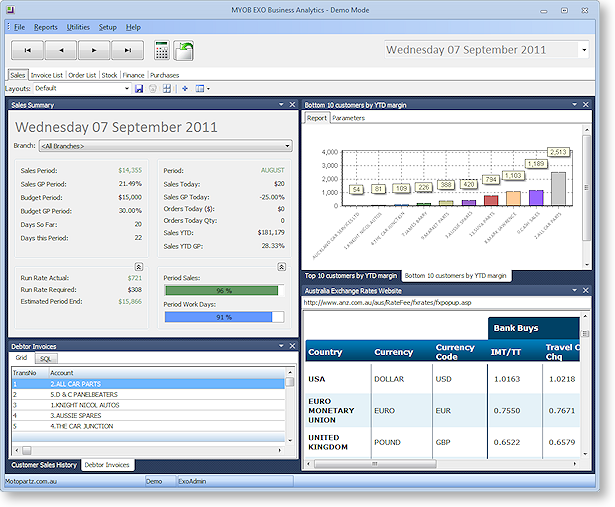 EXO Business Analytics is a separate module that presents a customisable overview of the organization’s business status. It is intended for use by management to monitor business performance. EXO Business Analytics extracts data from various sources in the MYOB EXO Business system and then displays it in a consolidated format. This allows managers to quickly get a complete picture of the entire business. EXO Business Analytics takes data snapshots at regular intervals. Use the arrow buttons to navigate between snapshots, or select a specific snapshot from the dropdown menu on the right. Click the button on any tab to re-calculate the figures for the currently selected snapshot. Click the button on any tab to refresh the display. Note: The Computer-level profile settings Recalculate and Refresh Analytics on Startup and Recalculate and Refresh Analytics every 15 mins when loaded can be used to automate the process of taking and refreshing data snapshots. The tabs on EXO Business Analytics are fully customisable. Each tab displays a collection of Dashboard widgets. Note: Tabs can be hidden from view on a per-user basis by configuring the Hide tabs in EXO Analytics User-level profile setting. Note: Two optional custom tabs can be defined by specifying values for the one or both of the Analytics custom tab 1 caption and Analytics custom tab 2 caption User-level profile settings (if no captions are specified, the custom tabs do not appear). All screens are read-only when accessed from EXO Business Analytics. 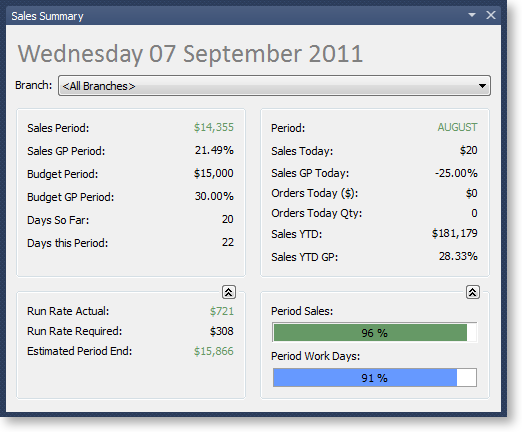 This widget displays the sales performance of the business. The Run Rate figures indicates what the business is doing on a daily basis (having made an allowance for the weighting applied to each day in the Period Day Plan Setup) and what the business must achieve (also on a weighted basis) to reach its period budget. The report uses colour to indicate whether the business is ahead of (green) or behind (red) the budget. This widget allows users to search for Debtors Invoices. For example, by setting the expected minimum and maximum margins, users can quickly locate invoices that fall outside the expected range. This range may include stock items that are over-discounted or that have a cost that is greater than expected. To search for invoices, check the appropriate boxes for the filters to use, then select details to filter by. Click the Run button to return all invoices that match the selected criteria. This widget allows users to search for Sales Orders. The list of orders can be filtered by Period, Account Group, Sales Person and Branch Name. 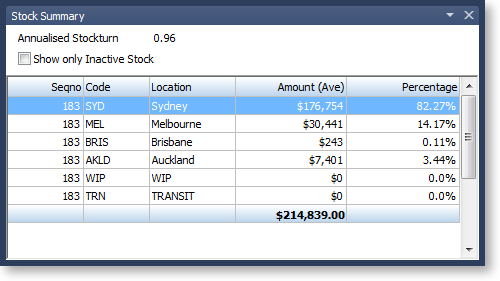 This widget displays the valuation of stock by location. 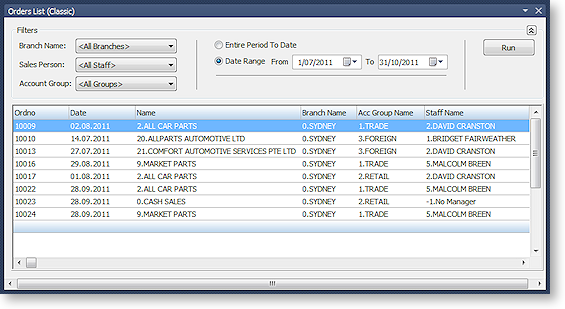 Users can select a location, and obtain a stock list by a stock item, for the selected location. The Show only Inactive Stock option displays a list of stock items that have been set to the Inactive status (by clearing the Active tick box on the Stock Item Details window). Stock items are listed only if the item quantity is greater than zero. Drilling down provides a detailed list showing the locations of the inactive stock. 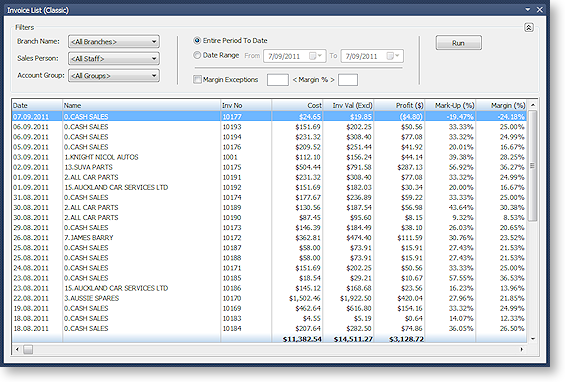 The Annualised Stock Turn KPI calculates the stock turn based on the current cost of sales on a period-to-date basis, using the current closing stock level. The KPI then converts this into an annualised estimate of current stock turn.